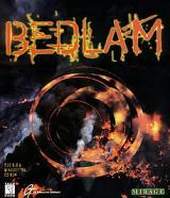 Bedlam is a faster, more mindless version of the Crusader/Syndicate school of gaming: isometric view, hard-core hellraisin'. In the future, we have come to rely on bio-mechanical creatures for our menial labor. Now these creatures have run amok and are raging across the city. As leader of a squad of Remote Assault Tanks (RATs), your job is to destroy the biomex wherever they are, and strike at the heart of their operations by wrecking key installations. Three RATs are at your disposal, each controlled from an "satellite uplink". They move and turn fast, and carry a nice assortment of weapons on their pylons. You start the game with a certain amount of money, and must buy weapons to arm each RAT. Bombs, bouncy grenades, sticky grenades, photon guns, conventional guns, delayed fuse bombs, and more provide a pretty good assortment of offensive weapons, with more available as you get deeper into the game. Defensive equipment like shields and sensors can also be fitted, though only two are allowed per RAT. Each mission has a primary goal and a number of subgoals, and begins with your RAT or RATs being dropped into the combat zone. The graphics here are, for the most part, pretty sharp, high-res visuals, with multi-level buildings, well-animated monsters, and plenty of fiery explosions. Each mission features a number of different elements that you need to understand to get through, tempering the action with a fair amount of problem solving. Most of this is based around switches, power fields, gates, and moving platforms which enable you to get from one level or area to another. In addition, money, power-ups, armor, weapon loads, and other prizes are scattered throughout the terrain. Almost everything in Bedlam can be shot or blown up and levels tend to move fast and furious, with lots of action and lots of carnage.